The name KUKA Robotics, which is headquartered in Augsburg, the capital of Swabia located in the south-west of Bavaria, speaks for itself. KUKA is one of the world’s leading robotics and automation technology companies, with an annual turnover of about 3 billion euros. The company offers the full range of services, from individual robots to automated production lines. Dmitry Kapishnikov, the CEO of KUKA Robotics RUS, told us more about the company in an interview with Capital Ideas. How long has KUKA been on the Russian market? Was it difficult to get established here or did you manage to bypass all the challenges? KUKA is celebrating its 120th anniversary this year. The company established an office in Russia over 10 years ago. Even in this brief period of time, we’ve run into the ups and downs that were happening with the country’s economy. In spite of this, the company has managed to establish itself as a market leader. In a more general sense, KUKA has been on the Russian market for a long time now. The first projects were implemented way back in 1968 for KAMAZ. In June 2018, our companies signed a new agreement on global strategic cooperation at the Automatica exhibition in Munich. We’re glad that for the past 50 years, one of the country’s leading technology companies has been committed to implementing advanced robotic systems on their manufacturing sites. How is business going in Russia right now? What kinds of products does KUKA RUS offer in Russia, and which fields is it used in? Can you think of examples of your robots here? What do they do? Our volumes grow, on average, by 30 percent a year. The main sphere that KUKA Russia wants to continue developing is the implementation of projects that use industrial robots. The automobile and metalworking industries – these are the spheres that typically use these kinds of solutions in our country. Robots already weld and paint the bodies of cars, collect consumer goods on pallets from the conveyor line, and perform other routine, time-consuming, and often dangerous work. Our goal is to introduce robotic solutions in spheres that don’t typically use them, like the banking, aerospace and nuclear industries. Nonetheless, we try to avoid limiting ourselves to just these spheres. We’re counting on digital solutions for turn-key automation of manufacturing processes with the help of not just industrial robots, but also robotic mobile platforms and industrial machines. KUKA is changing its approach to manufacturing organization, implementing a matrix model in modern enterprises. There is also the concept of manufacturing localization, which a series of foreign companies, including German companies, are currently implementing. Does your company have plans like this in Russia? For us, the Russian market has a lot of potential: sooner or later, the country will undergo a sharp growth period that will be linked to the modernization of manufacturing facilities for the introduction of robotic complexes. KUKA actively promotes these solutions in Russia. The Russian industrial robots market has just started to develop. We are considering the possibility of establishing robot assembly factories here once it makes financial sense. One of the conditions that would have to be met is that the market would have to grow to at least ten times its current size. Still, KUKA Russia is working on a number of partial localization projects and hope that we’ll be able to announce the launch in the near future. Does your company only supply the equipment, or do you also do installation and maintenance? KUKA’s base in Russia exceeds several thousand robots. It’s one of the largest infrastructures among all industrial robot manufacturers in Russia. So developing our service line is a priority task that we’ll be working on in the nearest future. We offer the same range of services in Russia that KUKA offers all over the world: a 24-hour technical support hotline; service plans for warranty and post-warranty service; and training in the KUKA College training center, where graduates get European-style diplomas. To what extent are enterprises in Russia robotized? Would you be able to say how many robots are installed in Russia annually? What is KUKA’s share of this total volume? The study conducted jointly by the Russian Association of Robotics (RAR) and the Ministry of Industry and Trade in 2016 showed that 70 percent of enterprises don’t use industrial robots at their factories. Also, according to the International Federation of Robotics (IFR), Russia is way behind other countries in terms of robot saturation in manufacturing. There are currently 3 robots installed for every 10,000 employees. On average, this number amounts to about 80 units in other places in the world, and maybe even higher. In our country, there are over 700 industrial robots installed every year. KUKA is a leader on this market, accounting for over a third of this volume. Is there something fundamentally different about the Russian market compared to the European market, for example? The Russian market is a developing one, and it’s similar to the markets of other developing countries, where the share of metalworking is over 50 percent. The European market is considered developed. There, the share of metalworking amounts to less than 10 percent. And the main share of this is machine tool maintenance and the food industry. Is there reason to believe the Russian market will grow? One sign is that a foundation has been created at the state level for the introduction of automated systems in the country’s enterprises. Right now, there development of digital manufacturing is a priority area of development for Russia. But it’s equally important to inform business representatives about the advantages of implementing automated solutions in factories in general, and especially about the advantages of robotic systems. This is exactly why the topic of digital manufacturing was a key subject at the Innoprom Exhibition – the main industrial platform for the exchange of experience between business and government. Our CEO Stefan Lampa gave a presentation at the main strategic session together with Denis Manturov, the Russian Minister of Trade and Industry. Moreover, from the time we first started working in Russia, we’ve been training personnel for the industry. There are robotic systems labs in the country’s leading educational institutions that were established with KUKA’s industrial robot base. Our company has been an official partner of WorldSkills Russia since 2015 in the “Industrial Robotics” category. Another task that we’ve set for ourselves is the establishment of technological solutions based on our robots. We’re creating an environment for the development of partnerships with technology integrators who are developing solutions for milling turbine blades for the aviation industry or sorting banknotes for the banking sector, for example. All of these are Russian companies, Russian know-how, and Russian patents. Usually, when discussing topics like automation and robotization in manufacturing, the following question pops up: can robots ever replace people, and is there a chance of them taking over? As people who work for a company that develops industrial robots, we understand that they’re created to help people: to replace them in dangerous and physically tough positions. Robots increase labor efficiency and improve our quality of life by eliminating routine work. They give us the opportunity to spend more time with families, or doing intellectual and creative labor. This may play out differently in fantasy films, but the reality is that people determine how robots work. Not the other way around. In your opinion, what will a factory of the future look like? Right now, we’re seeing a transition from traditional conveyor belt systems to systems based on mobile robotic platforms. 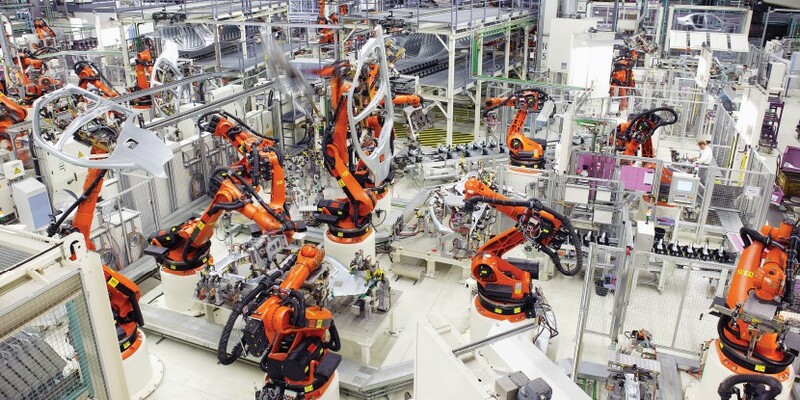 KUKA has already signed its first contract with one of the leading German auto manufacturers to replace a conveyor-type assembly line with a line based on automatic platforms. This is one industry trend that KUKA is actively developing. Creating plants of the future is our key competence. Romain Froquet: I would be happy to paint all of Moscow! Who will gather the biggest crowd? Bon Jovi, Metallica?..